The tutorial Preliminaries on Partial Words by Dr. Francine Blanchet-Sadri is available. The powerpoint presentation entitled Basic XHTML and CSS by Margaret Moorefield is available. The LaTeX Tutorial by Stephanie Rednour and Robert Misior is available. For a detailed account of a specific week, click on the week number. F. Blanchet-Sadri, “Algorithmic Combinatorics on Partial Words,” Chapman & Hall/CRC Press, 2008. F. Blanchet-Sadri, “Open Problems on Partial Words,” In G. Bel-Enguix, M.D. Jimenez-Lopez and C. Martin-Vide (Eds. ), New Developments in Formal Languages and Applications, Ch. 2, Vol. 3, Springer-Verlag, Berlin, Heidelberg, 2008, pp 11-58. F. Blanchet-Sadri, Deepak Bal and Gautam Sisodia, “Graph connectivity, partial words, and a theorem of Fine and Wilf,” Information and Computation, 206 (2008) 676-693. F. Blanchet-Sadri, N.C. Brownstein and Justin Palumbo, “Two Element Unavoidable Sets of Partial Words.” In T. Harju, J Karhumäki, and A. Lepistö (Eds. ): DLT 2007, 11th International Conference on Developments in Language Theory, July 3-6, 2007, Turku, Finland, Lectures Notes in Computer Science, Vol. 4588, Springer-Verlag, Berlin, Heidelberg, 2007, pp 96-107. F. Blanchet-Sadri and Mihai Cucuringu, “Counting primitive partial words.” Journal of Automata, Languages and Combinatorics, Vol. 15, 2010, pp 199-227. F. Blanchet-Sadri, Joshua Gafni and Kevin Wilson, “Correlations of partial words.” In W. Thomas and P. Weil (Eds. ), STACS 2007, 24th International Symposium on Theoretical Aspects of Computer Science, February 22-24, 2007, Aachen, Germany, Lecture Notes in Computer Science, Vol. 4393, Springer-Verlag, Berlin, Heidelberg, 2007, pp 97-108. F. Blanchet-Sadri, Taktin Oey and Timothy Rankin, “Computing Weak Periods of Partial Words,” In E. Csuhaj-Varju and Z. Esik (Eds. ), AFL 2008, 12th International Conference on Automata and Formal Languages, May 27-30, 2008, Balatonfüred, Hungary, Proceedings, pp 134-145. F. Blanchet-Sadri, Taktin Oey and Timothy Rankin, “Fine and Wilf's Theorem for Partial Words with Arbitrarily Many Weak Periods,” International Journal of Foundations of Computer Science, Vol. 21, No. 5, 2010, pp 705-722. F. Blanchet-Sadri, Raphael Jungers, and Justin Palumbo, “Testing avoidability of sets of partial words is hard,” Theoretical Computer Science, Vol. 410, 2009, pp 968-972. Faculdade de Ciencias e Tecnologia, Universidade Nova de Lisboa, Portugal, and Forum for Interdisciplinary Mathematics gratefully acknowledged and honored Professor Francine Blanchet-Sadri for Outstanding Contributions in Mathematical Sciences (the award was presented at the SCRA 2006-FIM XIII, 13th International Conference of the Forum for Interdisciplinary Mathematics on Interdisciplinary Mathematical and Statistical Techniques, New University of Lisbon-Tomar Polytechnic Institute, Tomar, Portugal, September 3, 2006). Kevin Wilson won a Goldwater Scholarship in 2007. Kevin Wilson won the Cornwell Prize from the department of Mathematics at the University of Michigan-Ann Arbor (this prize is given to “a student (graduate or undergraduate) at the University of Michigan who shall have demonstrated the greatest intellectual curiosity and given the most promise of original study and creative work in Mathematics”). Mihai Cucuringu was selected for Honorable Mention in the Computing Research Association's Outstanding Undergraduate Award for 2007. Naomi Brownstein was selected for Honorable Mention for a Goldwater Scholarship in 2007. Ajay Chriscoe's paper entitled "Periods and binary partial words: An algorithm. ", Theoretical Computer Science, Vol. 314 (2004) 189-216, was nominated for the 2006 Frank and Brennie Morgan AMS-MAA-SIAM Prize for outstanding research in mathematics by an undergraduate student. Naomi Brownstein received the “Order of Pegasus” which is the most prestigious and significant award a student can receive while at UCF. It recognizes students for outstanding academic achievement, leadership, service, and research. 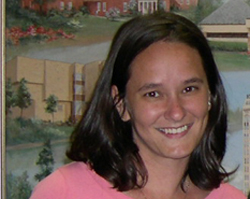 Naomi Brownstein was selected for Honorable Mention for the Schafer Prize for 2007. Kevin Wilson received a graduate research fellowship from the National Science Foundation in 2008. Naomi Brownstein received a graduate research fellowship from the National Science Foundation in 2008. F. Blanchet-Sadri, "Partial Words," 5th International Ph.D. School in Formal Languages and Applications, Tarragona, Spain, May 12-13, 2006 (10 hours). F. Blanchet-Sadri, "Partial Words," SCRA 2006-FIM XIII, 13th International Conference on Interdisciplinary Mathematical & Statistical Techniques, New University of Lisbon-Tomar Polytechnic Institute, Tomar, Portugal, September 2006 (Plenary Talk). F. Blanchet-Sadri, "Algorithmic Combinatorics on Words," SCRA 2006-FIM XIII, 13th International Conference on Interdisciplinary Mathematical & Statistical Techniques, New University of Lisbon-Tomar Polytechnic Institute, Tomar, Portugal, September 2006 (Invited Talk for Session on Undergraduate Research in Interdisciplinary Mathematics). Kevin Wilson, "Correlations of Partial Words," STACS 2007, 24th International Symposium on Theoretical Aspects of Computer Science, February 22, 2007, Aachen, Germany (joint work with F. Blanchet-Sadri and Joshua D. Gafni). 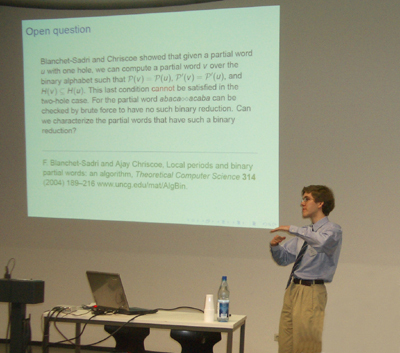 Kevin Wilson presenting the paper entitled “Correlations of Partial Words” at STACS 2007, 24th International Symposium on Theoretical Aspects of Computer Science, Aachen, Germany, February 22, 2007. Justin Palumbo, “Two Element Unavoidable Sets of Partial Words.” DLT 2007, 11th International Conference on Developments in Language Theory, July 3, 2007, Turku, Finland (joint work with F. Blanchet-Sadri and N.C. Brownstein). Justin Palumbo presenting the paper entitled “Two Element Unavoidable Sets of Partial Words.” at DLT 2007, 11th International Conference on Developments in Language Theory, Turku, Finland, July 3, 2007. Naomi Brownstein, “Two Element Unavoidable Sets of Partial Words.” International Conference on Advances in Interdisciplinary Statistics and Combinatorics, October 12, 2007, Greensboro, North Carolina (joint work with F. Blanchet-Sadri and Justin Palumbo). Naomi Brownstein presenting the paper entitled “Two Element Unavoidable Sets of Partial Words,” at the International Conference on Advances in Interdisciplinary Statistics and Combinatorics, Greensboro, NC, October 12, 2007. Naomi Brownstein, “Two Element Unavoidable Sets of Partial Words”, 16th International Conference on Interdisciplinary Mathematical & Statistical Techniques IMST 2008/FIM XVI, May 15-18, 2008, Memphis, Tennessee (joint work with F. Blanchet-Sadri and Justin Palumbo). Naomi Brownstein presenting the paper entitled “Two Element Unavoidable Sets of Partial Words” at 16th International Conference on Interdisciplinary Mathematical & Statistical Techniques IMST 2008/FIM XVI, Memphis, Tennessee, May 2008. F. Blanchet-Sadri, “Computing Weak Periods of Partial Words,” AFL 2008, 12th International Conference on Automata and Formal Languages, May 28, 2008, Balatonfured, Hungary (joint work with Taktin Oey and Timothy Rankin). F. Blanchet-Sadri organized a Session on Semigroups and Languages for the SCRA 2006-FIM XIII, 13th International Conference on Interdisciplinary Mathematical & Statistical Techniques, New University of Lisbon-Tomar Polytechnic Institute, Tomar, Portugal, September 2006. We attended the FOCS 2006, 47th Annual IEEE Symposium on Foundations of Computer Science from October 22 to October 24, 2006 in Berkeley, California. F. Blanchet-Sadri was invited to attend the conference "Promoting Undergraduate Research in Mathematics" from September 28 to September 30, 2006 in Rosemont, Illinois. F. Blanchet-Sadri served on the programme committee of LATA 2007, 1st International Conference on Language and Automata Theory and Applications that was held in Tarragona, Spain, March 29-April 4, 2007. F. Blanchet-Sadri chaired a session for LATA 2007, 1st International Conference on Language and Automata Theory and Applications that was held in Tarragona, Spain, March 29, 2007.